Limousin is the least populated region of France and is abundant with lush, green vegetation. Located in central France, it is an ideal place for those seeking unspoiled natural landscapes and tranquility. With over 1000 lakes, several rivers and gorges, the region is particularly popular with water sports lovers who engage in canoeing, kayaking, sailing and fishing. Also called the heartland of France, Limousin is considered the gateway between the relaxed Mediterranean South and the industrial North. As the region sees very little tourist activity, the cost of living is considerably lower. The capital Limoges, though generally not a hot spot for tourists, has notable buildings like the train station, the gothic Cathedral of Saint-Etienne and the Cour du Temple. The Porcelain Museum and the Bishop’s Palace Museum are also worth seeing. Close to Limoges is the town of Rochechouart, also named ‘the countryside of the meteorite’, which was hit by a 6-billion-ton meteorite. Although many consider it as the largest meteorite to strike the Earth, there is little evidence of it now. The walled city also has a 13th century chateau, which houses a modern art museum. Limousin was part of the province of Aquitania under the Romans. During the 10th century, several feudal units ruled the region. Northern Limousin was regarded as the country of Marche. In the middle of the subsequent century, the Duke of Aquitaine ruled a substantial part of the region, with the counts of Auvergne and Angouleme conquering the other regions. The French and the English engaged themselves in an increasing competition for Limousin in the mid 12th century. Henry IV brought the region under the control of France after the Hundred Years War. It became the French province of Plateaux du Limousin in 1790 with Limoges as its center. The village of Treignac on the River Vezere, has medieval houses with well-decorated doors and windows. These decorations include the shells, which are passed on as tokens of reverence by pilgrims going to Santiago de Compostela. The 12th century market hall and the Chapel of Penitents are also very interesting. The extensive medieval town of Uzerche is particularly notable for its several fortifications and old houses behind them. The 16th to 18th century building, Maison Boyer Chammard with its unique balconies is a curious sight to see. It is possible to walk along the banks of the Vezere and there are also tables laid out for picnics. The villages of Collonges-la-Rouge, Curemonte and Turenne form a cluster of the three ‘most beautiful villages of France’, which is located in the Southern part of the Correze region. Collonges-la-Rouge is particularly popular among tourists. The place looks entirely red due to the color of the locally available stone from which the houses are constructed. The Saint Pierre church, which dates back to the 11th century, is particularly striking because of the white stone on its doorway. The village of Curemonte is very pretty and has three prominent chateaux. Curemonte, due to its location on a hill, offers dramatic views of the Limousin valleys. 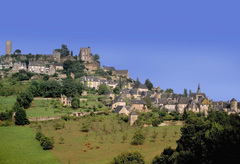 The beautiful village of Turenne dates back to the 13th to 16th century. The Cesar Tower constructed the 12th century and the clock tower built about 200 years later are particularly interesting. Meymac is another town in the Correze department, which has to be explored. The Abbey of Saint Andre, the Church of Saint Leger and the 13th century belfry are notable points of interest. The Meymac Museum offers a wonderful testimony of the bygone years. The small village of Saint Angel is located not too far from the Western side of Meymac. The Abbey of Saint Michel des Anges was once the home of the Benedictine monks. The first monastery is believed to have been established here during the 8th century.